With the help of retardant drops by air tankers, firefighters were able to stop the spread of a 25-acre fire near the Alaska-Canada border on the Top of the World Highway Thursday night. The Top of the World Fire was reported to the Alaska Division of Forestry office in Tok by officials at the Poker Creek-Little Gold Creek Border Crossing at 5:20 p.m. after multiple lightning strikes in the area. Border officials could see the fire from the border station and reported a large smoke column. The fire was growing rapidly and moving toward the border station when reported. Sixteen smokejumpers from the BLM Alaska Fire in Fairbanks were deployed to the fire, as were two air retardant tankers. 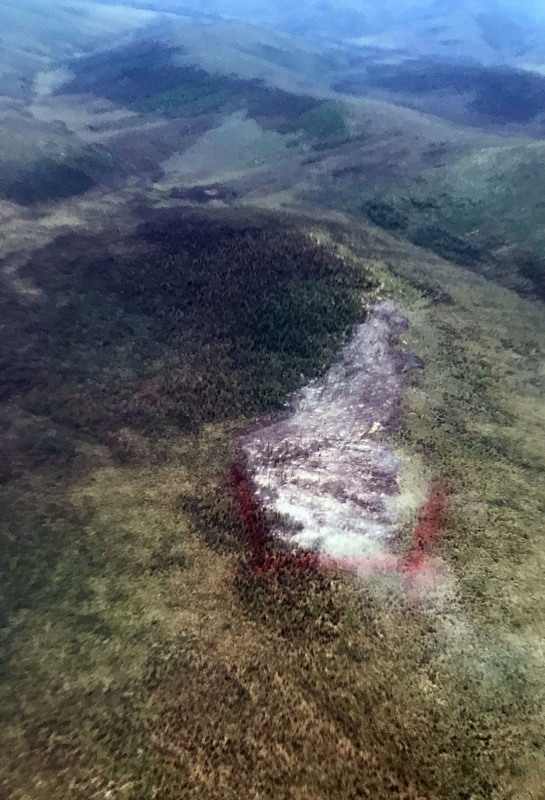 The tankers dropped three loads of retardant along the edges of the fire to keep it from spreading and smokejumpers worked past midnight to secure the edge of the fire. At 8 a.m. Friday, border officials reported no visible smoke on the fire and it was raining. Smokejumpers will continue working to secure the perimeter of the fire today and begin mopping up. The fire is approximately 7 miles southwest of the border station and 5 miles south of the Top of the World Highway, a 79-mile road that connects Tok and Dawson City, Yukon. Border officials closed the border into Alaska at 7 p.m. Thursday because of heavy smoke that reduced visibility and made for unsafe driving conditions. The border normally closes at 8 p.m. so the border station was closed for only one hour. Ironically, Canadian officials had already shut the road to the border because of another wildfire near Dawson that was impacting the road on the Canada side of the border.